This table installs/de-mounts in seconds and stores away in minimal space and requires no clamps or fasteners. A great addition to a great saw. I found the plans here... The plans can be downloaded as a PDF with dimensions and several 3D renderings for free, or you can buy a set of full size plans. Except for the locking bar, the whole thing is made from 16mm Baltic birch ply. 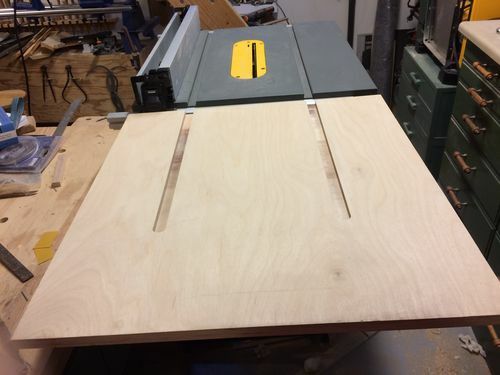 This is such a popular saw that I thought many owners who haven’t seen this outfeed table before might want one for themselves and so I am just sharing it with that in mind. 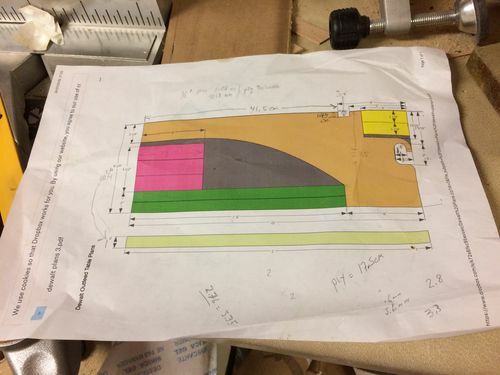 I found that my saw frame did not match the one in the plans so I first made a full sized cardboard template to see how it would fit. It didn’t, so I modified the template until it did, cutting and taping pieces on and off. Even after finishing it was still a little difficult to get the bottom outside hook on the vertical frame member, so I cut a little off the outside of it so it would slide easily on the top hook right into place. Worked great! If you want miter slots to match your table saw it is best to route these first. 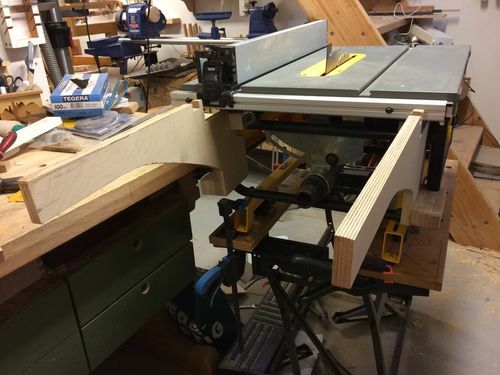 It’s a good idea to take your measurements from the outside edges of your table saw to the miter slots as they are not entered on the table, and then match your outfeed table top to the width of the table saw to insure accurate measurements. After routing your miter slots the first thing to do is to determine the position of the locking bar. It has to be located so that the edge of the table allows the saw fence to slide freely. Once your locking bar is located you are ready to locate the sliding rails which ride on top of the table supports. I did this by placing the table on the supports with the locking bar already glued on and with the table properly aligned with the tables miter slots, then I stuck the outside sliding rails on with double sided tape under the table tight up against the supports. Next I turned the table over and put a length of wood the same thickness of the supports next to the taped on piece and marked the outside rail and the inside rail positions with a pencil. Then I removed the tape on the rails to prepare for gluing on. I ripped a length of hardwood to fit my miter slots, sneaking up on it to get a perfect fit and used it to make sure my miter slots were lined up before locating the sliding rails. Not sure if I did this the easiest/best way, but it worked real well and my miter slots lined up perfect. I’m very happy with the results and I do highly recommend this solid outfeed table. Don’t hesitate to ask if you have any questions in case you weren’t able to decode my clumsy instructions. Thanks for reading! This looks like a super, thanks for sharing. Thanks Jim and Ivan. It’s kind of limited to the one tool, but I think there are a lot of them out there. Thanks for the idea Mike, I was about to build an outfeed table for the same saw model so your post came just in time! This will take up a lot less space than a full table and should work just as well for the few times I use the saw. Nice saw with a great extention. Welll done Mike. I’ve built all my models on the Dewalt table saw. It’s just the right size for building models, not to big but big enough for all your sliders and the like. Just add the Incra miter gauge and your all set. Plus the fence system is outstanding for such a small saw. I’ll have to add this to my favorites page for sure. Interesting out feed table design and ine that I had not seen before., Thks for sharing. You did yourself proud on this extension Mike. Those plans are well worth any effort to deal with. It makes the perfect compliment to having a portable saw with a extra table. Thanks guys. Yes Joe it is a clever design, wish I could take credit for it. It is a creative design. 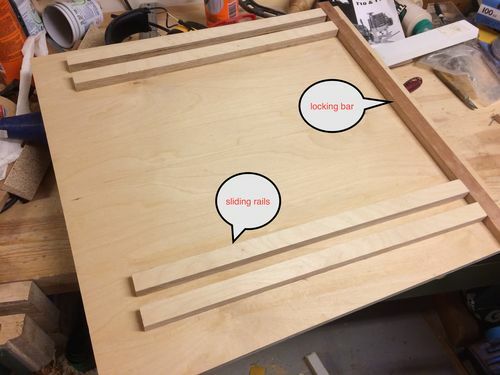 I watched the video (found from your link) showing how to assemble the table to learn how the locking bars worked – just a couple of bolts used to slide in matching holes on top and arms. I’ll keep this in mind if I ever try to make something similar for my table saw. Thanks for posting! Socrbent I didn’t use any fastener bolts and they are not needed. The locking bar (see photos) and the supports holds everything firmly in place. The guy in the video did not follow the plan for the rails set-up under the table. I don’t want to fumble around with bolts every time I install/remove the table. 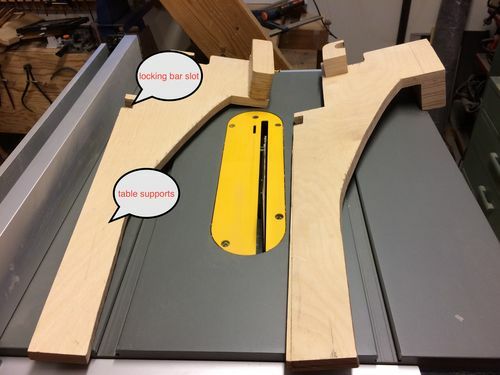 This is a great post for us Dewalters but would work great for other saws with some modification I’m sure. And again all this could be in the video.